Obverse: Jose Rizal, "150 years," "Republika ng Pilipinas," "1861-2011"
Reverse: logo of the Bankgo Sentral ng Pilipinas, "1 Piso," "2011"
This is the first legal tender coin to bear the new logo of the Bangko Sentral ng Pilipinas. we buy coins and banknotes in cebu, text us. Nice post keep it detectores billetes falsos and thanx for sharing nice post. I say your blog is awesome:-) Happy New year and goodluck to your blog! I really like this new peso coin nice design. Keep posting! Very interesting. It's one of the best design for a peso coin. Thanks for sharing.
'' 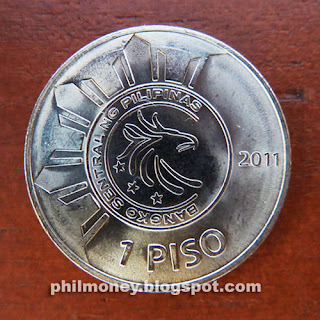 i feel ignorance when i saw new 'piso coins' and i decided 2 keep it 2 make habak! I found two coins each say five piso on them. Are they worth anything? Hi,i have read your whole blog,its very amazing,i am impressed.i have bookmark your site for revisit. WOW! What a nice coin thanks for share i just want to say please share more like it if you can. In fact Sakamoto Luma and Jose Rizal are my distant cousins. So there are also Jose Marti coins of Cuba and Michael Collins coins of Ireland as well as Jose Rizal coins of Phulippine. So these are best of coins of freedom fighters! hi, I am interested in buying old Philippine coins and bills. if possible, kindly send me the photos and price. I was searching on Google for some information”. I got chance, a geek’s blog so well that I like this whether, it would be specifically for me or not I like very much definitely will visit again. Mr. John Riley commented on the speech of Dr. Greg Pineda about The Mystery of 1907 Proof US-Philippine One Peso Coin. He stated that several trial pieces of 0.800 fine and 0.900 fine were struck at the Philadelphia US Mint to test the newly reduced size silver 1907 One Peso: and the two best quality pieces, one 0.800 fine and one 0.900 fine were presented for approval. The Central Bank Museum acquired the 0.900 fine Peso while the other went to Dr. Greg Pineda. The rest of the trial pieces are believe to be in the hands of a Filipino Collector. Mr. Ken Seymore gave the final presentation entitled ³The Philippine Mystery 1909 Proof Coin². He related a tale presented to him in a letter some many years ago. It was an offer to sell a Philippine 1909 Proof One Peso Coin. The letter told the story of twenty known pieces left and that they had been confirmed by the mint as real but cannot be authenticated because they were smuggled by mint employees. Such pieces were not presently known to exist. The pieces are now scattered amongst three owners somewhere in Manila. What puzzled Ken more was why this coin is not circulated before? Further research revealed that there was a plan to have them circulated to the Philippines in the same time as the 4 July 1909 Philippine Independence Day ceremony from the United States. The identity of the individual who offered the piece has long ago been forgotten, because at the time it was felt the piece was counterfeit. It was only recently that these new facts have crossed together. To this day the pieces have not shown up. Hopefully, they will, and more research can be done. Several people in the audience showed some excitement over the possibilities of these pieces existing and being real. Indeed! These coins are looking superb thanks for all the effort which you did for us. Beautiful Coins.I liked all Coins.Thanks for sharing these Coins with us. Very nice coins you have share with us,I was finding this type of coins. I was searching these types of the coins.Now i bookmarked your blog.Really very nice. So nice,I like this design of the Coin.Really very nice. hi! is it true that there are people buying 10-peso coins year 2000 and 2001 for a greater value? Euro is the official currency of the European Union/Council of Europe. Thanks for the information. From:Wayne. How much will you give for that coin I have one of those. 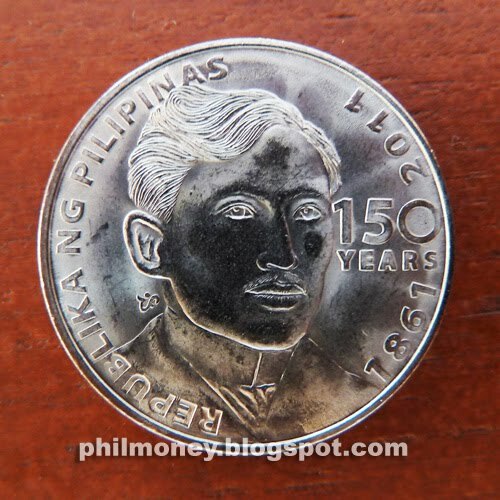 I have 1 piso coin 150th year of Dr. jose rizal, 1861 - 2011. I am going to sell it.. how much will it worth in dollars? Can u sell it to me, i offer 100,000. Per piece. Email me. itsmehmarlon@yahoo.com. I have. One of those 1 peso 150th year of Dr.Jose Rizal,how much will it cost if i would sell it? 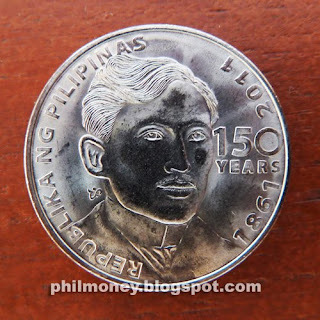 I have a 1 peso 150th year of Dr. Jose Rizal, how much would it cost i would sell it? Hi.I have 1pc of 1 peso coin jose rizal 150 years.How much is that? I have 1 pc of 10 cents euro,how much will it cost when I sell it? I have 1 piso jose rizal 1861. who would like to get this? contact me 09323437038. I have one 1861 to 2011 1 piso jose rizal coin. How much are you going to pay. New Generation Banknote Designs Released! When quoting articles and using photos from this site, please refer back with a link to http://philmoney.blogspot.com. The author does not claim ownership of all the Philippine coins and Philippine banknotes found in this site. Images and photos of Philippine coins and Philippine Peso bills without a watermark of this site were not taken by the author.